The Suntech Salmon Rod is the Suikei Special Honryu SST. I don't know what the SST stands for, but it might as well be Steelhead, Salmon and Trout. Suntech says the rod was designed for Sakuramasu and Satsukimasu - sea run Yamame and Amago, respectively. Sakuramasu and Satsukimasu are to Yamame and Amago what Steelhead are to Rainbow Trout. They're big, powerful fish and to catch them you need a big, powerful rod. The Yamame and Amago are actually salmon, not trout, so the Sakuramasu and Satsukimasu are salmon. They look and fight like salmon! For quite some time I have speculated that the Japanese carp rods should be adequate for steelhead (and I get asked about a "steelhead rod" quite a bit). The Japanese don't use carp rods to fish for salmon, though, they use salmon rods. Suntech now makes a salmon rod. The rod comes in two lengths, the Suikei Special Honryu SST 90 and the Suikei Special Honryu SST 101. Both are zoom rods. You can fish the 90 at either 8.4 meter or 9.0 meter lengths, and the 101 at either 9.5 meter or 10.1 meter lengths. 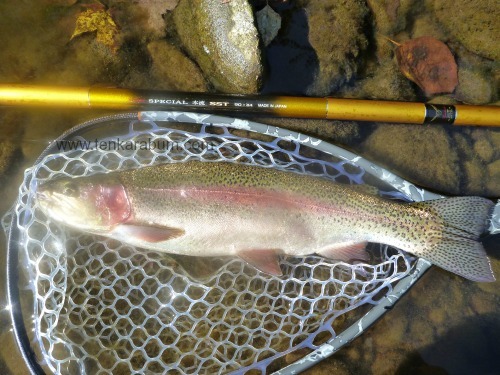 Suntech Suikei Special Honryu 90 and 20" rainbow. I've been curious about a fixed line rod capable of landing steelhead ever since I saw that 2008 Shimano video of Choji Hosoyama catching steelhead and salmon in Canada. I haven't had a chance to use the rod for steelhead, but based on how easily it handled the 20" rainbow in the photo above, I am pretty sure the rod will do just fine. 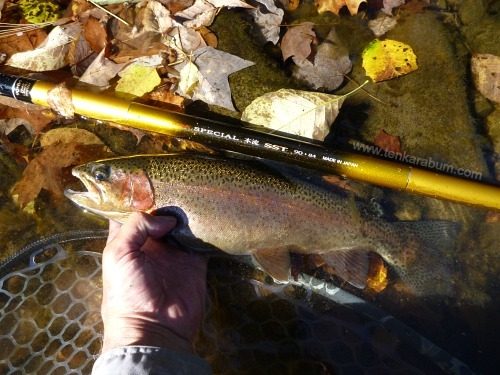 For smaller fish, like the chunky 15" rainbow in the second photo, the Suntech salmon rod is quite a bit more rod than you would need. A 15" fish will still put a bend in the rod but a 15 incher is not a fish for which you need a 9 meter or 10 meter rod. On the other hand, if I was fishing for fish over 24", or fish that are measured in pounds rather than in inches, I would not use a 13 or 14' rod (no matter how beefy it is). The video of the guy who caught a big trout in New Zealand, threw his rod when he couldn't keep up with it, and then had to swim to retrieve his rod is a perfect illustration of why not. If you are going to fish for big fish, use a rod intended for big fish. We in the West are still pushing the envelope - seeing what we can do with fixed line rods. There have been some pretty impressive catches with tenkara-length rods, but having to swim after the rod or breaking the rod are perhaps signals that there is a better way. Japanese anglers do fish for salmon. They don't do it with beefy tenkara rods. They do it with 8 or 9 or 10 meter salmon rods. They do exist. They are now available in the US. They are better tools for the job. Rods of that length are not light. Even with two hands the weight is noticeable. 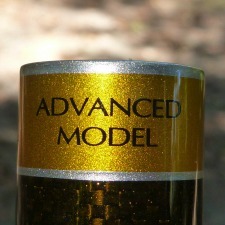 The Suntech Salmon Rod (or rather, the Suikei Special Honryu SST) is not a rod you will want to fish for modest fish. It is a rod you will fish because you need a big, powerful rod for big, powerful fish. If you are going to fish for steelhead, salmon or lake run brown trout that are the size of steelhead, use a Steelhead, Salmon and Trout rod - the Suntech Suikei Special Honryu SST. The rod is a honryu rod - basically a keiryu rod for bigger water. In Japan, keiryu (mountain streams) flow into honryu (main streams). Honryu rods are longer, but not necessarily beefier. There are very long, very light honru rods for very light lines and very modest fish but this isn't one of them. The Suntech Suikei Special Honryu SST is very long but it is rated for much stronger line for much stronger fish. The tippet rating for the rod raises an interesting point. The rod is designed for tippet ranging from 7X to 3X. Most tenkara anglers never use tippet as light as 7X even for the 9-10" they generally catch. I certainly would not use 7X when fishing for steelhead, but it is interesting that the rod can protect it (although not if you hook a steelhead). The Suntech salmon rod can protect tippet that light because it has a progressive bend profile and because it is very long. The length spreads the force from the pull of the fish over a very large arc. That same reason allows anglers to catch salmon with 3X tippets. That is lighter than some carp rods, but the carp rods are shorter so they don't have the same large arc. Of course, carp also get larger than the Sakuramasu and Satsukimasu for which the rod is designed. For that matter, carp get much larger than Great Lakes steelhead, too! I have never caught a steelhead. Based on comments from people I have spoken to who have, and who have compared them to large trout and to carp, I am pretty confident the Suntech salmon rod would do just fine. Either rod is available by special order. The price will be dependent on the dollar/yen exchange rate at that time. Domestic shipping plus insurance is $50 via USPS Priority mail. The shipping charge will be added to your order automatically. International shipping will vary by country, but probably will be about $65. Please request a quote before ordering. Payment will be processed by PayPal but you do not need a PayPal account. You can pay with a credit card.